Mensusa https://www.mensusa.com/articles/gold-mens-blazer-pair-with-other-products-for-the-best-look.html Gold Mens Blazer- Pair With Other Products For The Best Look A gold mens blazer , gold mens dress shirt, gold tuxedo and many other products are available for bringing something unique to your style at MensUSA.com. Deciding what to wear to a semi-formal event is not an easy task. Part of you wants to blend in, while the rest of you wants to arrive with something unique to offer in the way of fashion. So you choose a gold blazer to wear, because it is very unique and you will probably be the only one wearing it wherever you are going (and if done well, it actually looks pretty classy). Did you know there are other products available out there to pair with your gold blazer or to wear instead of choosing your gold blazer, such as if you want to stick with just wearing a vest instead? Here is why you should choose a gold mens blazer and other gold colored products to wear to your next semi-formal event, and how to mix and match them to get a good, classy and unique look. It turns out wearing gold is just one of those fashion statements that you can pull off no matter what time of day it is, day or night. It is a classy color to wear if you do not overdo it and you know how to match different styles of dress and accessories to make it look good. While you are not going to want to wear a full gold outfit anywhere, you can use a gold tie to brighten up an otherwise darker outfit or test how far you want to take your gold look and accessories. Be warned that wearing gold will draw most eyes to you, so be bold and go for it if that is what you want. You might want to start off with only one or two pieces of your outfit being gold before taking it a step further. If you do want to take it one step further and dive right in, though, here are some other gold outfit options to go along with your gold men's blazer. You do not have to stop at just wearing the gold blazer. You can also opt for a gold mens dress shirt to wear under it, which will keep your entire outfit on your upper body in the same color scheme. If you are going for the all gold look, or you want just a gold dress shirt, there are plenty of options out there to choose from. Whether or not you wear this option really depends on the type of event you are going to. Most formal events you are probably not going to want to wear a gold tuxedo jacket, which is when a gold tie could come in handy as an accent instead of making up the whole color scheme of the outfit. However, there are options available out there if you start searching online to see if you can find something close to what you are looking for. If you are going with a white dress shirt and want a vest to go with it, one way to stand out in the crowd at a semi-formal event is to wear a gold vest and tie. You can browse online for the exact kind and shade of a gold vest and tie before going to try them on in person at a store. Just make sure that if you are going for this combination, the gold vest and the gold tie are the same color gold. You can wear just the vest portion of a three piece suit and it still technically looks professional enough to be considered semi formal as long as your dress shirt is full-sleeved. Deciding what to wear in the way of semi-formal fashion for men is not always an easy choice, and if you decide you want to try a gold ensemble for the evening, it might take a little planning and a lot of trying on different combinations of outfits to find just the right one for you. Wearing gold, whether it is just a gold blazer or a gold shirt or a gold vest and tie or some varied combination of all of these options, will make you stand out. If this is the look you are going for, take extra time and care to ensure it is going to work and that you are not overdoing it too much. 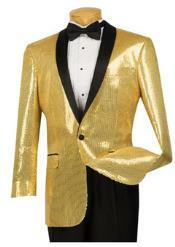 Start with your gold blazer and begin searching the other products available out there. With enough searching you may find the perfect style that makes you unique and sophisticated all at once.